Now that I've been so helpfully introduced to the Photobucket site, I can start using some of my own photos right here in our forum. Many people are creeped out by mummies...the idea of viewing the desiccated body of someone who died thousands of years ago. We have over 20 mummies on display at the Field, and though only two of them are unwrapped, judging from the facial expressions I see on many of our visitors, two are more than enough. Dead bodies don't bother me. I used to be an EMT with an ambulance service and, believe me, I've seen much worse. 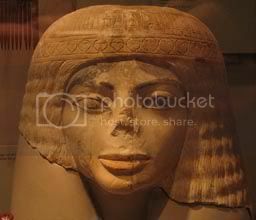 This is the bust of a New Kingdom woman. We call it the Michael Jackson bust. The resemblance is disturbingly obvious, and to me it's proof that plastic surgey has been keeping Wacko Jacko alive for more than 3000 years. Every time I see this bust, a chill runs through me. Or maybe a statue with longish, greasy black hair and only one hand wearing a glove? Ack! The first one shows us what MJ has been taking to the plastic surgeon as a go-by! Whoever has done is work should be banned from practicing medicine! Isn't that just the truth? Didn't there used to be something called ethics? I mean, these doctors are certainly intelligent enough to realize that over time they have literally turned Michael Jackson into a freak. Michael Jackson is the only one who can't see it. But I suspect these doctors are more interested in Wacko Jacko's deep pockets (or at least they used to be deep) than in medical ethics. This New Kingdom bust really does creep me out. I love pointing it out to people, and everyone gets a kick out of it...although I think they walk away as creeped out as I am. ...... ........... first question that occured my little brain when I saw that pic: How the hell is that possible that an Ancient-Egyptian bust looks exactly like Wacko-Jacko???????? Or maybe *shivers*....(just a crazy thought) maybe M.J. is just the re-incarnation of that Egyptian man/woman... lol, just kidding.... ....but hey.. what if? I mean seriously? Do you know where this statue is from? It is intriguing to me. It is from the new kingdom, that is nice I will look into that time period, but where was it found? I think it would be interesting to know if they made it like that on purpose. It looks like a friend of a friend I knew. Shelley Esaak : Statue of a Woman - Egyptian, New Kingdom, ca. 1550 B.C.-1070 B.C. This looks exactly like the statue of Amenhotep III's wife that is found in Luxor. I saw a picture of one here...http://egiptologia.com It is in the first window that scrolls.